According to Kazuho Mitsuta, a director and producer of Ultraseven, at planning stage, Dan Moroboshi performed by Koji Moritsugu was a mere driver of Ultra-Keibitai (The Ultra Guard), not a regular member. He was supposed to overcome a lot of hardships and then admitted as a regular member. However Mr.Moritsugu didn’t have a driver’s license back then, so he was set to be a regular member from the beginning. Kazuho Mitsuta played the announcements in The Ultra Guard Base. You can hear his voice at the scene of Ultra-Hawk’s launching. Pointer was GREATLY-MODIFIED Chrysler Imperial ’57 South ampton 4Door Hardtop. 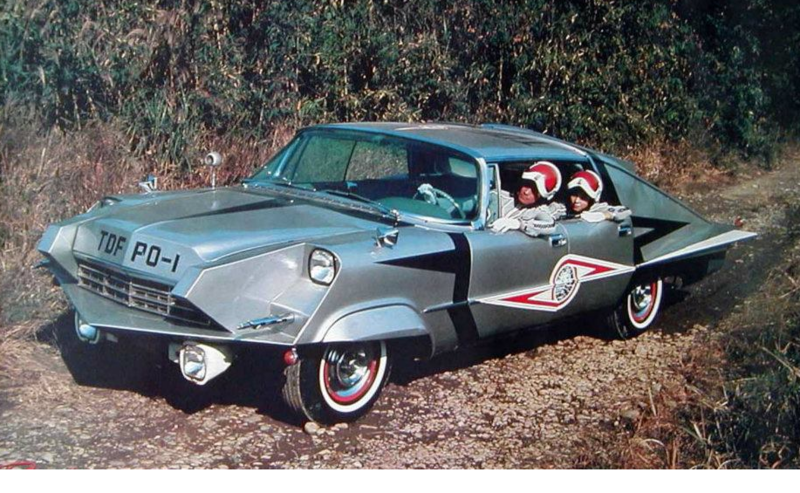 As you might know, Tsuburaya production bought it as used car but it was terrible condition. It stalled out so frequently. The staff often had to pushed the car up to a slope to film a scene where Pointer runs. After all episodes were aired, this cool vehicle was presented to a certain kindergarten in Tokyo.